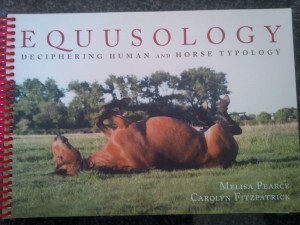 This deck of 52 beautifully illustrated cards started my journey into equine facililitated learning. You will be delighted reading the in-depth, prophetic messages from the horses. What is so different about these card decks, other than their beautiful artwork? The inspiration and guidance that is offered on the cards will encourage you to reflect upon your dreams, desires, and challenges. Every day, just pick a card that appeals to you in that moment and read its message. You will be amazed with just how appropriate the message is to what you are feeling or dealing with. 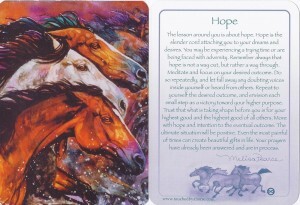 They often provide you with comfort as well as reaffirm your actions and decisions. Priced at $35 plus shipping and GST. A workbook by Melisa Pearce and Carolyn Fitzpatrick enabling you to “personality type” yourself and your horse, and provide you with tools to work better together. Priced at $35.00 Cdn ($24.95 USD). Contact us for shipping details and prices. Check back soon for additions to our 2018 schedule. Beginning in May, we invite you to join us for an evening of pampering. While you groom and connect with the horses, they will pamper your soul with their very special brand of “pony love”. The evening includes time with the horses and insightful discussion. This is followed by a fireside chat, either at the firepit or the fireplace! Purchase individual tickets in advance for $30 or packages of four for $100. Use the tickets for yourself or your friends. What a great way to wind down from the work week and prepare for the weekend! Learn the basics of being safe and comfortable around horses in this one-day experiential workshop. Learn to halter and groom a horse. If you’re afraid, you have an opportunity to confront that fear in a safe and supportive environment. Learn about herd dynamics and body language. You may come away with some surprising nsight into communication and community in addition to some knowledge about horses. Bring your curiousity and adventurous spirit!! Springtime sale price of $125 includes lunch and a take-away gift. Springtime sale price (including horses and horse handlers) is $750 for a half-day. Book a full day f or $1,250 and lunch is on us! This 12 week individual coaching package includes six weekly half-hour sessions by telephone or Skype calls plus two ninety minute coaching sessions with Jocelyn and an equine co-facilitator at Celestina Ranch. Special limited time bonus – free attendance at two Equine Connection evenings! Priced at $600 plus GST. Please check back as more workshop dates will be set soon.